She was born on August 12, 1924, in Croton, Iowa, the daughter of George and Ellen K. Fett Schoene. She graduated from Argyle High School as Valedictorian of the Class of 1942. On October 17, 1945, Betty was united in marriage to Dale Newberry at the First Methodist Church in Fort Madison. He preceded her in death on April 18, 2011. She had been employed at Shaffer Pen during WW II, from 1942 – 1945. She then spent the rest of her life being a farmer’s wife and homemaker. She was a faithful member of the Argyle Presbyterian Church in Argyle, IA. She enjoyed being outdoors and working in her flower gardens. She loved to cook, quilt and clean her house. 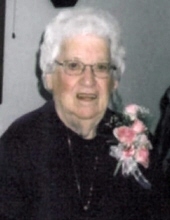 Most of all Betty loved her family and enjoyed spending time with her children, grandchildren, great-grandchildren and great-great-grandchildren. She is survived by three children, SueAnn (Larry) Peterson of Montrose, Steven (Linda) Newberry of Argyle and Jane (Mike) Phillips of Weslaco, TX, six grandsons, twenty-two great-grandchildren and eight great-great-grandchildren. Funeral services were held at 10 a.m., Tuesday, February 12, at the Argyle Presbyterian Church with Pastor Shelby Whitney and Pastor Alice Hawes officiating. Burial was in the Argyle Memorial Gardens. Visitation was held Monday, February 11, from 5 – 7 pm at the Argyle Presbyterian Church with family meeting with friends at that time. "Email Address" would like to share the life celebration of Betty June Newberry. Click on the "link" to go to share a favorite memory or leave a condolence message for the family.